Royal Enfield Bullet Trials 350 Scrambler and the Bullet Trials 500 Scrambler are slated to be launched tomorrow (March 26, 2019). 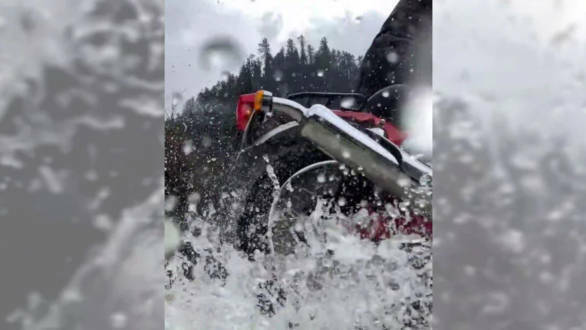 Earlier this month, the company has teased the motorcycle in a video where it showed the motorcycle crossing a water body on a trial section. The video mentioned two things, "the most enduring tale" and the launch venue which is Pune, India. The Trials scrambler features a single seat and a luggage rack and dual-purpose tyres. The bike gets an upswept exhaust to enhance its trail riding capabilities. The leaked images of the Trials models also show that while the body features chrome and silver paint, the frames have been highlighting in different colours. The Trials 350 and the 500 Scramblers may borrow the engine from its siblings and will have similar power and torque outputs. Both the engines will be compliant with the soon to be implemented emission regulation norms. A dual-channel ABS (Anti-lock braking system) will be standard on both the motorcycles. The price of the Trials 350 and the Trials 500 could be around Rs 1.7 lakh and Rs 2.2 lakh ex-showroom pan India. Right now, the motorcycle doesn't seem to have a rival in this market space as the closest scrambler is a premium motorcycle and is priced much dearer to its customers.